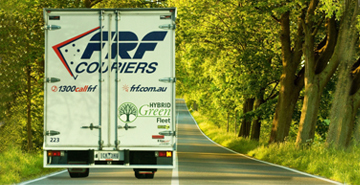 FRF Couriers is a proud and ongoing supporter of GreenPower and Greenfleet. GreenPower is a government accreditation program for renewable energy whilst Greenfleet is an Approved Abatement Provider under the Australian Government’s Greenhouse Friendly™ initiative. As a transport company with over 250 vehicles, we are very aware of the impact that we, together with our customers, have on the environment. Through the support of such companies like GreenPower and Greenfleet, we hope to reduce our own carbon footprint and better educate our staff and clients on the need to reduce unnecessary emissions. At FRF, we understand that in running a fleet of over 250 vehicles, we must be responsible for our actions to the surrounding community. Whether it is now or into the future, reducing the impact our vehicles have on the environment around us will remain a constant focus. The latest ABS Motor Vehicle Census claims that the average age of vehicle fleets amongst transport companies in Australia is 15.4 years. The average age of vehicles on the FRF fleet is 4.3 years. It is a testament to our commitment to the needs of the environment, that in conjunction with our suppliers, FRF have developed a plan to implement a fleet of trucks which are compliant with the latest emissions regulation. Having a fleet of trucks that are all compliant with the highest standards is just the beginning in our implementation process. We now also run a substantial fleet of Hybrid vehicles, ensuring we stay one step ahead.